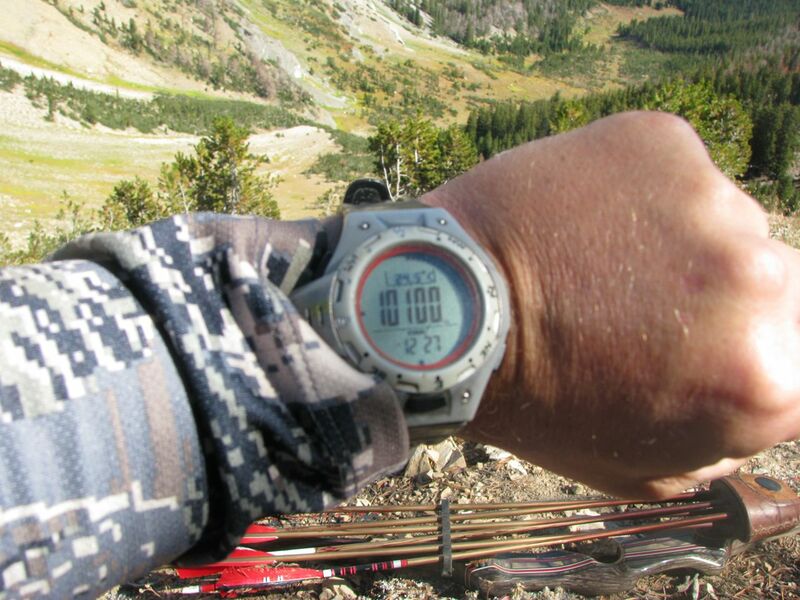 The 2011 archery season was finally here and once again, I found myself pounding the rugged mountains that I love so much in Western Wyoming. On the second day of the season, I located a respectable 4 point with a 27” spread. I watched him all morning until he bedded in a small patch of trees. Behind the trees lay a rugged cliff that no normal buck would even think of trying to traverse. My plan was to set up that evening and wait for the buck to get up and feed in my direction. As luck would have it, he got up and navigated his way around the cliff as I sat there dumbfounded. As I sat there wondering what to do next, several bull elk sounded off in the bottom of the basin. The next thing I knew, I was rushing down into the basin to try and make a play on the elk. I got within 100 yards of a nice 300” six point and his cows. We talked back and forth but the bull was not having it. He gathered his harem and moved lower in the basin. As the elk disappeared into the thick pine forest, I started to look back up into some different avalanche chutes. Within seconds, I located a tall heavy buck staring right at me. After further inspection, I got excited as I realized I was looking at a really good deer. His backs were awesome, and a little drop point off his left main beam added to my excitement. As I watched him up in the steep, rocky basin, I thought he looked like a much smaller version of the legendary Goliath. This buck didn’t hold a candle to Goliath, but at that moment, I named him Baby G and decided this was the buck I would focus all my attention on. The next morning I found him again, but only caught a glimpse of him as he headed to his bedding location. That evening, I made sure I was in a favorable position to glass the basin he bedded in. I watched three bucks feed out from the trees and carefully pick their way around a rocky outcropping. One of the bucks was a great looking four point that any mule deer hunter would be happy with. Finally, the tall heavy buck fed out into the opening. My heart raced as I liked what I saw. For the next three days I lived with and watched the buck in the same basin. I felt very confident that I knew enough about the buck to be able to harvest him. I also felt that I would risk blowing him out of the country if I tried any stalk with my traditional equipment. 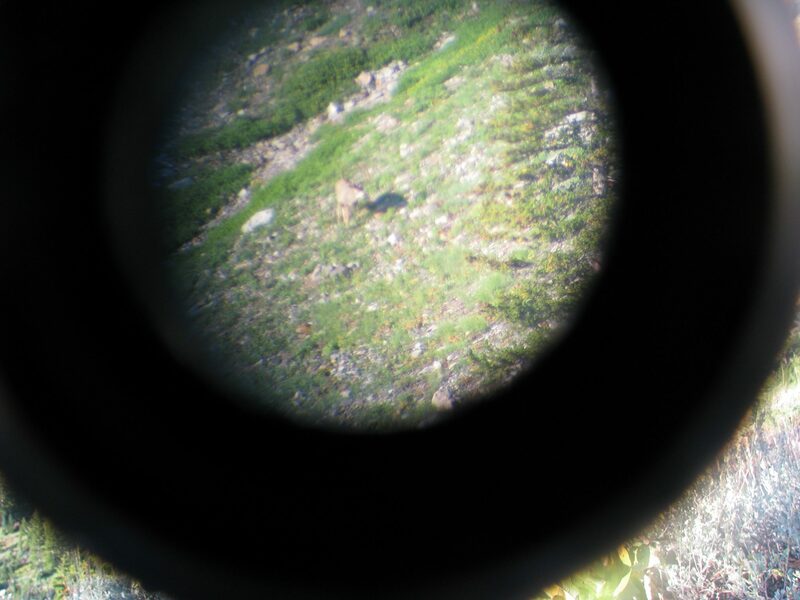 My vacation came to an end and I made plans to return the following weekend to watch and learn as much as I could about Baby G.
The following weekend, I made my way to the high alpine perch in hopes of finding Baby G. Unfortunately I never laid eyes on him the entire weekend. Discouraged? Not really; knowing he was up there somewhere. With the rifle season coming in just a few days, I knew I needed to go back to the drawing boards and figure out a new game plan. I also got some words of encouragement from David Long. David told me, “Even though it seems these bucks of fallen of the face of the earth, there still up there somewhere.” So after more research and study of the country, I realized there was one basin that I did not look into that was almost in a hole. I truly believed this could be the spot where I would find Baby G once again. The day before opening day, I started my mission on relocating the deer. After straining my eye through the spotting scope all morning, I turned up only one buck. He was so far away that I could not tell if it was him or not, but a good buck to say the least. At least it gave me a good idea on where I wanted to be in the morning. Opening morning I positioned myself on a ridge looking into the basin that I could only hope Baby G would be hiding. After about 20 minutes I found the nice four point that usually hung out with Baby G. Two of his smaller companions also came into view as they fed in the rocky basin. After an hour, the four point bedded down out in the opening only 400 yards below me. As I scanned the opposite side of the basin, I picked up a deer and my heart raced. It was him and he was just standing in the rocks basking in the morning sun. I ranged him at 600 yards and felt confident to make that shot, but I just did not want to do so. I was also scanning the basin for other hunters. It was already 8:30 in the morning and I felt confident that I had the basin to myself. I decided to make things interesting and I planned my stalk. Once I reached the knob that would give me a 175 yard shot, I realized I had made it just a little to late as I figured Baby G went and bedded in a small finger of trees. Just then, five to six shots started to fly from the opposite side of the basin. My heart dropped. Failure, sadness, and heartache overcame my emotions. I had worked so hard to put myself in the best situation to take this buck and now he is dead. Or is he? I noticed four hunters over on the same ridge that I was originally on. Perhaps they killed the four point that I watched bed down just below that same ridge earlier that morning. I looked at the spot where Baby G was feeding and there was a finger of trees that I hoped blocked the other hunters view. I figured that if luck was on my side, those other hunters never located Baby G and killed the four point instead. And with just a little more luck, that smart old buck was hiding in those trees getting ready to make an escape. It took about 20 minutes for two of the hunters to make their way down to spot where the four point was bedded. The other two hunters stayed on the ridge. At that point, I realized that maybe, just maybe this still might work out and they would push Baby G right out in front of me. Just then, I caught a glimpse of the velvet covered rack escaping from the small row of trees. I couldn’t believe it and my heart began to race like it never has before. Baby G made it through the first little opening and into a small patch of really thick scrub pines. The next opening was only 15 yards wide. It was my only chance and if he made it through there, he would be gone forever! I pulled up my .270 and waited for him to reach the opening. Once he did, he picked up his speed, but it was to late. I took an off hand shot and it hit him hard! Once he was hit, he turned down hill and went into the very thick scrub pines. This is when things became more interesting to say the least. I could hear the buck below me in the scrub pines about 30 yards below. It sounded like he was going down for good. I left my pack up on the knob and went back to get it which was a mistake looking back on it now. Once I reached my pack, I heard a gun shot go off. My mind began to race once again. I looked down in the basin and saw one of the hunters grab his gun and head straight down towards my buck. I was starting to get really worried by this point. I raced down towards the other hunter and caught up with him. I asked him if he had shot the buck and he said no, but the other guys on the ridge took a shot at him as he very slowly moved down through the pines. The hunters had radios so I asked him what they had seen. The two guys on the ridge said the buck was barely moving and they only had a hind quarter shot and took it. I was starting to get sick at this point. What the heck is going to happen now? The other hunter and I started to follow the blood trail but it disappeared. The other hunter somehow got off the trail which did not bother me. I could see in the moist dirt exactly where the buck had navigated through. I then found some more blood and at that same moment, I could see the buck in the trees in front of me. He was 50 yards away and I was able to put him down for good. 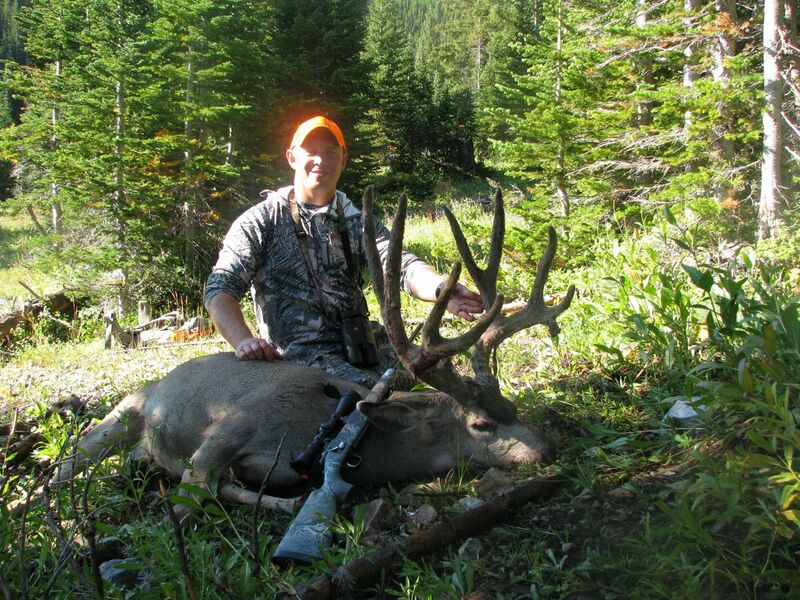 Public land hunting can be very interesting and very unpredictable. The shot that the hunter took from the ridge grazed his back leg and after further inspection, my first shot hit him in the front of the front shoulder. What a roller coaster of emotions! It has always been a fear of mine to experience a hunt like this and it was never how I planned on taking this great buck. Luckily it worked out in the end. Nearly 7 hours of packing out my trophy, I was drained and exhausted! It was the most grueling pack of my career. 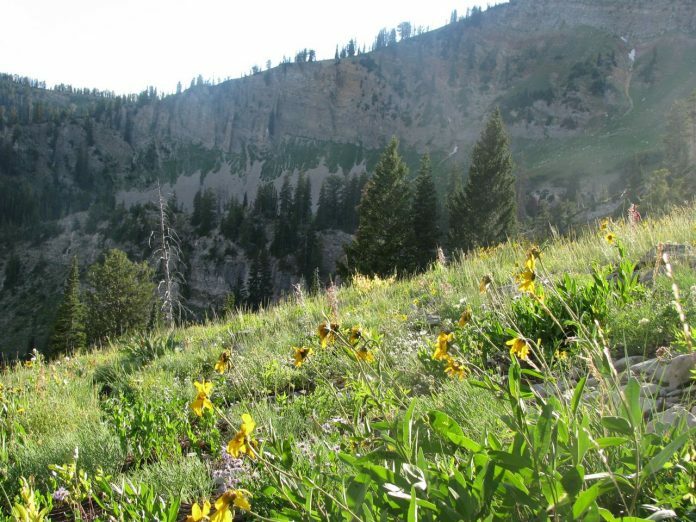 I’m not sure how long my knees will allow me to pursue high country muleys. But as long as they continue to hold up for me, I can assure you, I will be chasing the gray ghosts of the high country!